Note: This post was written in May, just after we arrived back in Maine for the summer, but for reasons that are unlikely to be made clear in the near future it disappeared shortly after it was published. You may note that when I wrote it, we still intended to return to the boat in the fall – but that plan changed abruptly in June. No, we are not done cruising, but there are some things that need to be accomplished ashore before we venture out again. It’s quite possible that our future cruising will look very different than before, but we and Sionna are very definitely headed out again. Anyway, this blog is – at best – mired in my shore-side lethargy. The unknowns of the situation, and my discontent with how things stand, have sapped my will to write, and you, dear reader have had nothing to read as a result. My apologies. Life happens when you make other plans. It always feels like a mixed blessing, this seasonal cruising thing. On one hand, Sionna is tucked away in a safe place, securely tied to the ground and well inland. She’s as safe in our absence as we can make her. On the other hand, our home and magic carpet of nautical dreams is alone, baking in the sun, while we are waiting for summer, layering clothing, and looking for work. And here we are, in “the most beautiful cruising grounds in the world” (as we were told by some folks in the British Virgin Islands) with no boat. It feels strange, and disjointed, and not a little disquieting. So naturally we’re looking ahead, wondering how to arrange our next season aboard, but more immediately we’re trying to line up our summer work, so that we can afford to HAVE our next season on the boat. There are uncertainties. There are concerns and quandaries, and choices to be made. Our trip back north took 7 days, and included a visit with my (Keith’s) brother and sister-in-law at their new home in a clothing-optional community in western Florida – a very new but surprisingly comfortable experience for us – as well as visits with three sets of cruising friends in three separate cities. It was a social whirlwind from which I think I’m still recovering, but it sure was nice to see those folks again. It reminds us why we cruise. Oh, and the sunsets, of course. We do miss those sunsets. Categories: Cruising, Land life | Permalink. Certainly Sionna isn’t the only boat that’s taken a turn toward a spell on land! Here’s another one. Recently I was asked if I’d be interested in reading – and then reviewing – the work of a friend and fellow cruiser. Quite apart from the honor of being asked, I was tickled at the opportunity for a view inside the mind of another writer, and someone I’ve shared snacks aboard with, to boot. The book is called “Learning from a Uke”, written by T. J Akey. 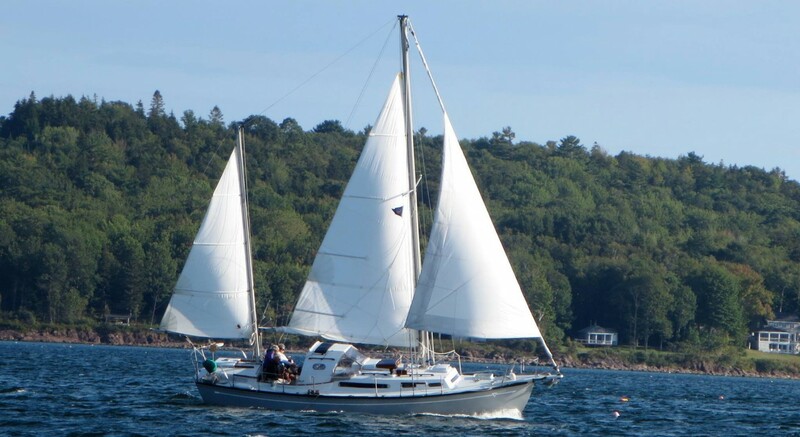 Tim and his wife Deb have been out there aboard the s/v Kintala doing this cruising thing for a goodly time – something I respect a great deal. Add in the fact that they are just genuinely nice people, AND former pilots like me and, we’ll, it’s a good fit. The idea of Ukulele-as-mentor would not have occurred to just anyone, I’m sure. Certainly it has not occurred to me, and yet the parallel is sweetly apt. Some tasks or skills invite us to delve deeper, to think harder, to explore dark corners of ourselves that we’ve avoided before, and certainly learning to produce music – simple or complex – offers room for the occasional epiphany. Tim Akey’s journey is reminiscent of the writings of Richard Bach, that well-loved philosopher pilot who’s musings entertained and provoked a generation of novice metaphysical thinkers. He teases out meaning and significance where we least expect to find it, and entertains us along the way. A short book, yes. But the first step in a long journey of connections. If I’ve piqued your interest, take a walk over to Amazon and pick it up. It’s a little book, with a big message. Here are a few photos to add to the mystery of our existence. If you’ve been wondering what the crew of the good ship Sionna is up to, (and of course you HAVE been wondering, because the doctrines of narcissism demand it) these should give an idea. Stay tuned. We’ve got nine months to turn this place into something a bank would smile upon! Now that I’ve accepted the idea that we’re not going back to the boat this winter (now that I can say that out loud without choking up) I’m suddenly discovering other cruisers who’re doing the same – or at least a similar – thing. One of those is Ed Robinson and his wife, Kim. Ed is a writer of some merit, and his book (I’m not sure if Kim helped – maybe “their book”?) “Quit Your Job and Live on a Boat” was one of many I read as inspiration and grist for my personal idea mill. For quite a while they maintained a blog, then called “Leap of Faith”, and now – after their move back to land – called “Creekside Musings“. No, it’s not a cruising blog, but I take some comfort in the realization that it’s ok to take a break – even from something you love. The future is never carved in stone.